I used to lurk in these forums in late nineties. Then work and family took over. My original account is long lost, but some things remain from that age including couple of amps that I had built with my own hands. One of them, which was built in 2001, if I recall correctly, is Aksa original amp. One channel gave up and no longer works. 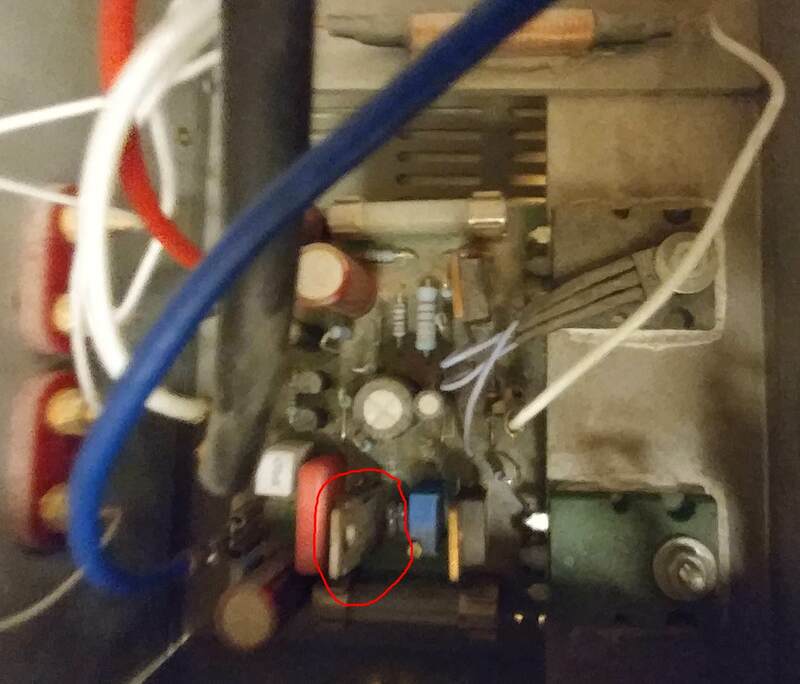 I suspect blown transistor in the first stage, since it gets smoking hot (circled red in the pic). I've actually burned my fingers pretty bad. I do not have any plans for the thing, or a part list. I am contemplating whether it is possible to revive it without a major effort. Any ideas what may wrong and what is the part that I need. Does it have to be matched pair (L/R)? Is that even an original AKSA board or a DIY copy ? It looks like it's caked in dirt and dust and really should be cleaned up or it's just a bad photo. Blown transistors usually don't run hot, either because they are open circuit (no current) or dead short (no voltage), the problem is possibly elsewhere. Are both fuses OK? Is there a voltage at the output ? Can you measure any of the operating points - voltages around the circuit. Last edited by Bigun; 29th July 2018 at 09:48 PM. That's an original AKSA, Bigun! Thank you for your post. Mingdao, if the voltage amp is running hot it likely means that the npn output device, C1302, is blown. Measure the voltage from the positive rail to the emitter on that transistor; if it is less than 1V, it's your man. Replace it and the amp will sing again! I have to say, without wanting to be offensive, that is probably the dirtiest ugliest looking AKSA i have ever seen.... Clean that up Dude !!!Please ! Start with compressed air, then start with isopropanol, which does not leave a stain. I would suggest you take it from the heatsink too to remove the dust around the output stage. I have a feeling the npn output device (2SC5200) is blown, so you might need to change it, or both in fact, the pnp as well. Can't hurt! That’s no way to treat an actress! True enough...... but in that industry, Gareth, she might quite like it?